Add in 1 teaspoon of clove. Add homemade banana leaf syrup. Pour perfectly brewed mango & strawberry tea into saucepan and continue to heat till warm. 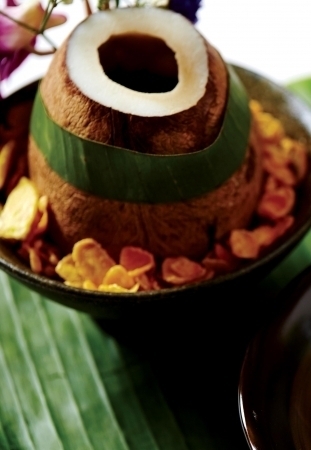 Pour mixture into dry coconut shell (allow heat to open up flavours within coconut). Add lemon zest to perfume it (outside of coconut shell).